ORONO, Maine — The University of Maine men’s hockey team’s home woes — and Northeastern University’s road prowess — continued on Saturday night. The 11th-ranked Huskies scored three goals in the first 4 minutes, 32 seconds, of the second period en route to a 4-0 Hockey East victory over the Black Bears at Alfond Arena. The Huskies (14-4-1 overall, 8-2-1) improved to 9-1 on the road while the Black Bears (7-11-2, 3-5-2 HE) fell to 1-5 in their last six home games and have been outscored 17-4 in those contests. Northeastern beat UMaine 3-2 on Friday night. On Saturday night, sophomore center Zach Solow scored his 11th goal of the season 17 seconds into the second period to break a scoreless deadlock. Former Black Bear Liam Pecararo, a senior right wing, notched his sixth 2:59 later and redshirt senior right wing Hawkins capped the flurry at the 4:32 mark on the power play. It was Hawkins’ sixth goal and his first on the power play. He added an insurance goal early in the third period. Sophomore goalie Cayden Primeau, son of former longtime National Hockey Leaguer Keith Primeau, made 33 saves in posting his third shutout of the season. 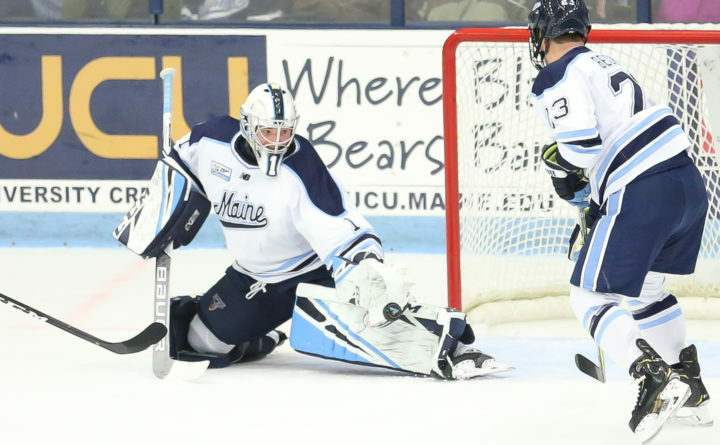 UMaine sophomore Jeremy Swayman wound up with 25 stops. Solow’s goal was a strange one as players for both teams appeared to anticipate an offside call that never came and Solow was the only one who kept skating. “I’ve never had nine guys on the ice stop playing before. I kept playing because I never heard a whistle,” said Solow. He explained that Pecararo made a pass that was behind the intended recipient but that the puck kicked off the wall really hard into the high slot. “I anticipated a whistle so I made a pump fake because I didn’t want to shoot it and get called for a penalty. There wasn’t a whistle so I pushed it (around a UMaine player) and threw it on net,” said Solow, whose shot from the inner half of the right circle trickled through Swayman’s legs. Pecararo expanded the lead off a well-executed 4-on-2 rush. Grant Jozefek slid the puck to Julian Kislin in the middle of the high slot and he spotted Pecararo motoring down the left wing. Pecararo gathered in Kislin’s pass and ripped a wrist shot past Swayman from the left faceoff dot. Pecararo played 25 games at UMaine during the 2014-2015 season before going to the United States Hockey League the following year and eventually transferring to Northeastern. This is his first and final season at NU. Hawkins made it 3-0 only five seconds after going on the power play. Tyler Madden won the faceoff to Jeremy Davies, who sent the puck to the top of the left circle where Hawkins blistered a one-timer past Swayman. “Obviously, as soon as we gave up that first goal, it took the wind out of our sails and we let them get two more,” said UMaine coach Red Gendron. “(On the first goal), we stopped playing assuming it was offside. “We didn’t react to it very well and, before we knew it, we were down 3-0,” he added. “That has been a thing for us all year that we can’t seem to fix right now. But when they score one, we seem to deflate and all our energy is gone,” said UMaine senior co-captain Chase Pearson. UMaine’s Brendan Robbins had an opportunity to cut into the lead later in the second period on a breakaway but Primeau gloved his short wrister. With 47 seconds left in the game, Hawkins received a five-minute major and game misconduct for elbowing Adam Dawe, who had to be helped to the locker room by two teammates. There was a brief scuffle in the postgame handshake line and the referees and coaches sent the teams to their locker rooms. UMaine backup goalie Stephen Mundinger received an unsportsmanlike conduct penalty. On Friday, NU outshot the Black Bears 42-21 and received first-period goals 5:58 apart from Brandon Hawkins, Patrick Schule and Matt Filipe (power play) to build a 3-0 lead. The Huskies survived Ryan Smith’s second-period goal and Dawe’s power-play goal with 3:38 remaining.